"2006 Best Film of the Year"
George Pennacchio of ABC 7 Eyewitness News in Los Angeles interviewed Chris Folino, Gamers' director, Roberto Blasini, Gamer's D.P., and William Katt (Reese's Boss - see a clip from the film). The interview aired on Dec. 29. A segment about Gamers will be on Gamer.TV on STARZ. Chris Folino, director of Gamers, was interviewed on CNN Pipeline on November 30th. The interview. The Hollywood Reporter featured an article about Chris Folino and the making of Gamers in 2006. "The movie is a lot of fun." "It has a very rather humorous premise to it"
"Five out of Five Stars"
"Gamers the film definitely has something to offer everyone, its irreverent humor is a perfect mix of wit and obscenity that plays well off the subject matter." "The movie is sharp and witty, and sort of slams SPINAL TAP into OFFICE SPACE, with an episode of FAMILY GUY stuck in the middle." "If you've ever sunk endless hours of dedication and love into a game or an RPG character, you'll understand exactly what the guys in Gamers are going through." "Geekhood is celebrated at it's best in "Gamers" a very funny film"
"A hilarious film to watch for gamers (video or card) as well as geeks in general or those that like to make fun of them." "It's Spinal Tap meets Free Enterprise, for throwers of 20-sided dice"
"I really enjoyed this movie. I laughed. I wept. I learned a lot about myself. Actually, I just laughed, heartily and often." "Gamers has spark, heart and originality"
"Enjoy it, laugh at it, and be glad you're not them." "Gamers has an appealing twisted sense of humor"
"I give it a 9 out 10"
"This comedy is a blend of Napoleon Dynamite and This Is Spinal Tap"
"It could well become a beloved cult film, and not only for the Gamer set"
"It's our hobby's answer to Best in Show"
"A much funnier and meaner Napoleon Dynamite"
"Earns more Experience points than ten Happy Madison Productions"
"This film delivers a truck load of laughs"
"This one is the real deal, people. You will laugh and everyone will see some of themselves in this movie"
"This is a solid release from Sideshow of a flick that will definitely own a spot on many cult film fan's shelves in the future." 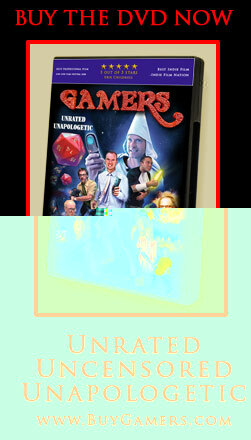 "Gamers is an amiable, likeable - and funny - film that doesn’t demand the audience to be into gaming to enjoy." "Gamers has a twisted sense of humor, some really solid production value (for such an inexpensive flick), and a bunch of funny 'no-names' who might be seen again soon. Fun stuff." "Some of the cruelest and funniest film moments you’re likely to see"
"Mockumentaries are hard to pull off and I think he did a great job of taking an extremely uninteresting game (for most of us, anyhow) and poking some cruel, old-fashioned fun at it." "the next cult classic movie"
"With so little to chuckle about on the big screen lately, I highly recommend getting a copy of "Gamers". It's somewhat dark and downright cruel, but it's also freekin' hilarious. A solid 4 ½ cans out of 5." "Gamers is as good as any big budget comedy that hit theaters in 2006. You also have to appreciate that this film was shot in a mere 6 days, an incredible accomplishment that most films aren't capable of accomplishing." "What really sells the film, however, is the comedy. There are some truly classic bits." "There are moments in this film that'll make you laugh until you cry." "It's sort of a darker version of "Revenge of the Nerds." Gamers is available nowhere else on the web - support indie film!